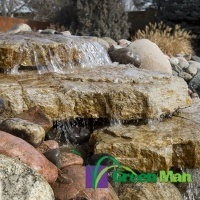 Since 1994, Green Man Lawn & Landscape has been providing exceptional landscaping services to a wide range of commercial and residential properties in Longmont and the Front Range. Our experienced designers and craftsmen set the standard each day. The grass will definitely be greener on your side of the fence! 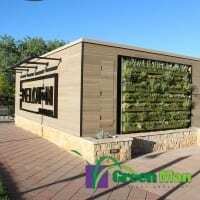 Whatever you can dream, we can do...waterfalls, ponds, pergolas, green walls, rooftop gardens, outdoor kitchens. From new construction to existing landscapes that need a face lift, we are the landscaper for you. We know what you expect your properties to look like and we deliver. 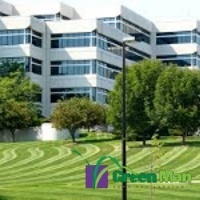 Green Man Lawn & Landscape started in 1994 as a one-man crew with a borrowed lawn mower and 10 customers. Fast forward to today, we have expanded our operations with a staff of over 40 people, 20 trucks, and over 300 clients servicing the beautiful Colorado Front Range. We continue to rapidly grow each and every year. Green Man Lawn and Landscape is a full-service landscaping company with the ability to take your project from a dream into a lush environment. It all begins with our experienced landscape designers who will draft your vision and dreams into a concept. Throughout the process, our designers will your be liaison so you can freely communicate, bring in new ideas, and share different thoughts until the last plant or stone is placed. We have put together a professional team with many years of experience to provide you the best customer experience with an aptitude to attention to detail to help you achieve your landscape's fullest potential. We do what we say we are going to do, and when we say we are going to do it! We have been serving Longmont and the Front Range since 1994. We have a reputation for our attention to details and customer satisfaction. We stay in constant contact with our customers throughout the entire project. We are fully insured, including General Liability, Worker's Compensation, and Automobile insurance. Certificates of Insurance will be provided upon request. We also have Business Licenses in all cities where we perform work. Take back your free time! Call us today for your free landscape consultation. The staff at Green Man are true pro’s! I appreciate the time they took to answer all of my questions and concerns as i have a large backyard that requires some serious work. Green Man was excellent to work with in designing and planning, as well as execution. The final amount was exactly what we had originally discussed. The workers were beyond considerate while on our property and went above and beyond with our landscaping project. I will definitely use Green Man for my additional landscape needs. Green Man helped us tremendously this past summer on big projects at both The Hub and 17 Walnut. Very quick to respond and the work quality was great! Green Man recently installed a water feature in our backyard. We love it! Our designer, Travis, made the whole process of getting this done really easy and pretty stress-free. Our next project we are planning on doing soon is a fire pit and pergola. We will definitely be using Green Man for this as well! They are the best Landscape Company in Denver, I highly recommend them! They have done large projects for me at a Condo Complex in Thornton, new install, down to one homeowner spring clean up! Travis Popiel Is an outstanding professional to work with on your lawn and/or sprinkler project. Present and available when needed. We had an issue caused by the rain, but he was right there to take care of it for us. © 2019 Green Man Lawn and Landscape. All rights reserved.